Mission managers are proceeding with preparations for a launch attempt this morning (Saturday, June 28) of a high-altitude balloon carrying the Low-Density Supersonic Decelerator (LDSD) test vehicle to the edge of space. The test flight is being conducted from the U.S. Navy’s Pacific Missile Range Facility in Kauai, Hawaii. At present, weather conditions are favorable as the balloon is being prepared for launch. The Saturday balloon launch window extends from approximately 2:15 to 3 p.m. EDT (8:15 a.m. to 9 a.m. HST). The balloon is expected to take approximately two to three hours to rise to 120,000 feet. Shortly thereafter, the test vehicle will be released from the balloon and a rocket will ignite to take the LDSD vehicle up to 180,000 feet before beginning it’s descent test. For the latest updates on the mission, follow these twitter accounts of LDSD team members: @TangoDeltaNom, @steltzner, @EricMBlood, @SteveWSell; as well as these official NASA twitter accounts: @NASA_Technology, @NASA, @NASAJPL and @NASA_Marshall. NASA will stream live video of the test via Ustream at: http://www.ustream.tv/nasajpl2. NASA’s LDSD program is part of the agency’s Space Technology Mission Directorate, which is innovating, developing, testing and flying hardware for use in NASA’s future missions. 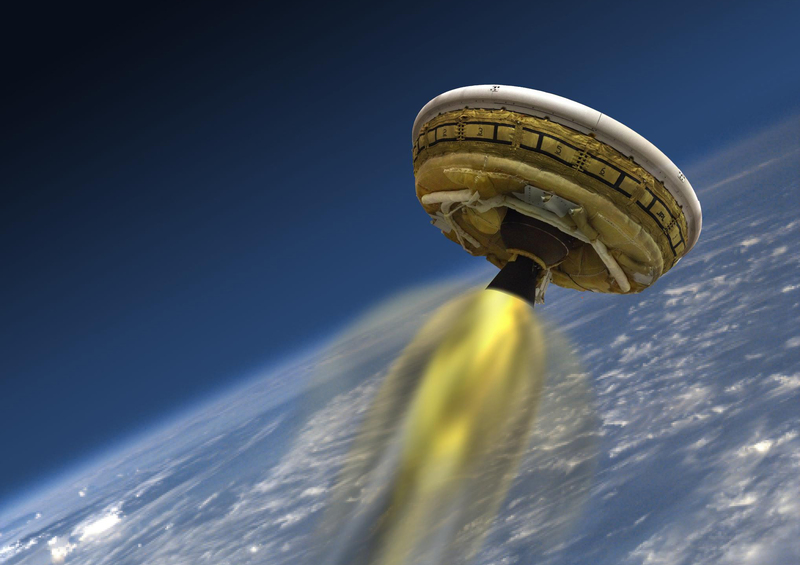 The saucer-shaped test vehicle for NASA’s Low-Density Supersonic Decelerator (LDSD) will undergo a series of events in the skies above Hawaii, with the ultimate goal of testing future landing technologies for Mars missions. At the beginning of the flight test, the vehicle hangs from a tower in preparation for launch. The launch tower helps link the vehicle to its balloon. At T-minus 0, the vehicle and balloon are released from the tower and begin a slow ascent to an altitude of 120,000 feet (36,600 meters), where the vehicle is released from the balloon. The float to drop altitude is expected to take slightly less than three hours. After being released from the balloon, the vehicle’s rocket kicks in and quickly takes the craft to an altitude of 180,000 feet (54,900 meters) – the top of the stratosphere — where the supersonic test begins. Small solid-fuel rocket motors spin the test vehicle for stability ahead of the main motor ignition. Upon reaching its maximum altitude, the test vehicle is traveling at approximately Mach 4. The test vehicle will then deploy the Supersonic Inflatable Aerodynamic Decelerator (SIAD), which decelerates the test vehicle to approximately Mach 2.5. 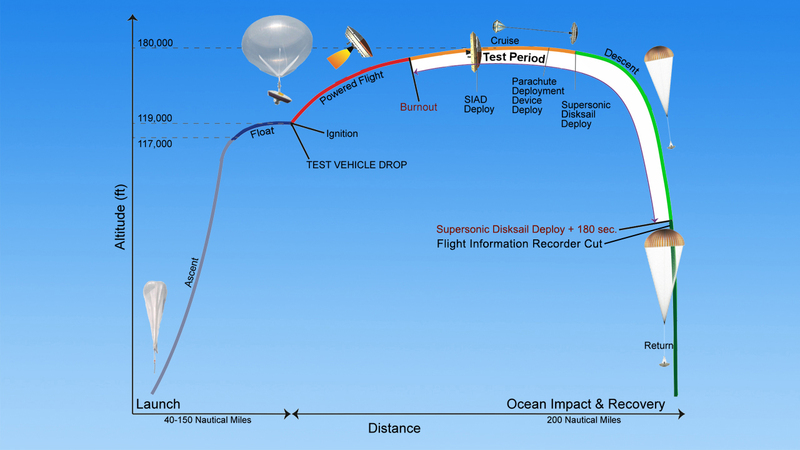 The test vehicle will deploy a mammoth parachute (the Supersonic Disk Sail Parachute), which carries it safely to a controlled water impact about 40 minutes after being dropped from the balloon. Following the flight test, both the balloon envelope and test vehicle will be recovered. The Low-Density Supersonic Decelerator Project is managed by JPL for NASA’s Space Technology Mission Directorate in Washington.